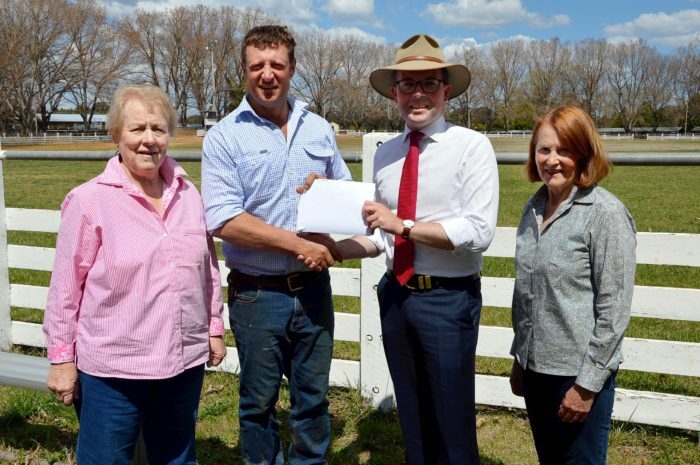 Northern Tablelands MP Adam Marshall presents Guyra Show Society President Richard Post with a $5,000 cheque for next year’s show. They are flanked by Show Society Secretary Dorothy Lockyer, left, and Vice President Rita Williams, right. THE long-running drought and a disappointing attendance at the 2018 Guyra Show, had left the Guyra Show Society committee’s cash reserves low, creating a quandary around planning for the 2019 show. Newly-elected show society president Richard Post and his hardworking committee were determined that the ‘show must go on’, so turned to local MP Adam Marshall for assistance to make the 2019 show one not to be missed. The Northern Tablelands MP asked the NSW Government to consider making funding available for next year’s entertainment feature and was delighted to receive news that a one-off grant for $5,000 was on its way to Guyra. “The Guyra Show Society has held its annual show for 110 years, and it is an important community event that is only as strong as the support it receives,” Mr Marshall said. “Unfortunately, falling volunteer numbers in recent years, coupled with the ongoing drought and a lack of income during that time – meant the show society were facing a much-diminished offering for the 111th show next year. “The good news is that the society has regrouped after a tough couple of years, they have a new president and a re-energised committee dedicated to making the Guyra show a financial success. President Richard Post said the funding boost came as a wonderful surprise and will give the show society a chance to deliver an exciting event for all ages. “What a great relief to have this support and the committee is thrilled to have the chance to secure some must-see talent for next year’s show, no doubt, it will be a great show in 2019,” Mr Post said.